Water Birds by Helmuth/Danard for bass clarinet, Bb clarinet, computer and wireless network infrared sensor system, performed by Rebecca Danard and Mara Helmuth. 2010.
photo: Mara Helmuth and Alan Bern performing The Man and the Moon at ICMC in Belfast, 2008. Lifting the Mask appears on Sounding Out! surround DVD. 2010. everglade.org, amazon.com. Where is my Voice? appears on disk 2 of 50th Anniversary University of Illinois Experimental Music Studios commemorative collection CD. Steve Sunderland, text. 2008. UIEMS. Sound Collaborations, a compact disk of collaborations with Alan Bern, Ming Ke, Allen Otte, Rick VanMatre and Anna VanMatre, with the tape work Abandonded Lake in Maine. 2007. Centaur Records, v. 36 of Consortium to Distribute Computer Music CRC 2903. Meeting the Free Dreamer appears on Open Space CD 16, released in 2004. Implements of Actuation, a compact disc of compositional collaborations with percussionist-composer Allen Otte (2001), is available from the Electronic Music Foundation at CDeMUSIC. 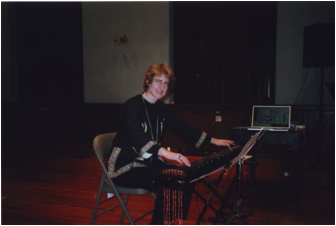 photo: Mara Helmuth performing on qin at Town Hall, Cincinnati, Dec. 2005, by Keith Wahle. Water Birds for clarinet, bass clarinet, computer and wireless sensor network. composed by Mara Helmuth and Rebecca Danard. 2010. 10 min. Improvisation with Qin, Percussion and Computer No. 3, 2007. 10 min. The Man and the Moon for accordion and computer. composed by Mara Helmuth and Alan Bern. 2004. 15 min. Smoke for tenor and soprano saxophones and computer, composed by Mara Helmuth and Rick Van Matre, and graphite painting installation by Anna VanMatre. 2004. 16 min. Inchoate Energies for piano and electronics. 2004. 7 min. China Prism for dancer and interactive light sensor installation. 2004. variable duration. Expanding Space for tuba and computer. 2011. 15 min. The Birds for picc., perc., 2 vn, vla, vc, db, tape. 2010. 2 min. Meeting the Free Dreamer (revision) 2008 for piano and computer. 9 min. Light Descends Into Your Heart, 2008 version for piano and computer, 5 minutes. Butterfly Within for flute and computer. 2006. 6 min. Primary Materials for percussion trio and computer. 2006. 10 min. No. 7 for Gyil and Computer. composed by Mara Helmuth and Allen Otte. 2004. 9 min. The Edge of Noise for NeXT (soprano, flute, percussion, electric guitar, piano, violin, cello, computer). 2004. 8 min. Mountain Wind for pipa solo, flute, alto flute, bassoon, violin, 2 cellos, computer. 2003. 9 min. Origins of a Fantastic Dream for orchestra and computer. 2002. 10 min. Loonspace. 2000 Percussion and tape. 13 or 9 min. Mellipse 2 for percussion and tape. composed by Mara Helmuth and Allen Otte. 1999. 13 min. Implements of Actuation. composed by Mara Helmuth and Allen Otte. 1998 Electric mbira, bicycle wheel and tape. 21 min. Move! 1996. Snare drum and tape. 4 min. 1998 version collaboratively composed by Mara Helmuth and Allen Otte. 7 min. Evolutions. 1994. 8 instruments and NeXT ISPW. 25 min. Hidden Mountain. 2007-. Interactive installation at the SinoNordic Arts Space in Beijing. Staircase of Light. 2003. Light sensitive installation in the Sino-Nordic Arts Space, Beijing. Sound Colors. 1995, 1997. Audience Interactive Installation for NeXTstation 040 and SGI. Lifting the Mask for video. 2008. 5 min. Mountain Wind 2 for pipa solo, 5 instruments and video. 2004. 8 min. Device & Devices with video by Kimberly Burleigh. 2002. video. Where is my Voice? 2008. text by Steve Sunderland. 6 min. bugs and ice: a Question of Focus. 2002. sounds of nature. 6 min. Abandoned Lake in Maine. 1997. Loon sound environments. 12 min. Ah!. 1995. fixed format withvoice and percussion sounds. 1 min. Meeting the Free Dreamer. 1992. algorithmic piano sounds. 10 min. Dragon of the Nebula. 1991. granular synthesis composition. 9 min. Mellipse. 1989, rev.1995. moving elliptical filters and gentle sound masses. 8 min. Cloudburst for piano. 2011. 1 min. String Paths, graphic score for 1-6 percussionists. 2007. variable duration. Light Descends into your Heart. 1997. piano. 3 min. Songs for Mezzo, Cello and Percussion. 1990. 12 min. Two Meditations. 1990. alto fl., clar., bn., 2 vn., pno. 6 min.